What remains of ancient monuments are architectural fragments which can 'allow us to think through the orientation of the practices which both created that architecture and which were staged within it.' [J. Barrett 1994]. 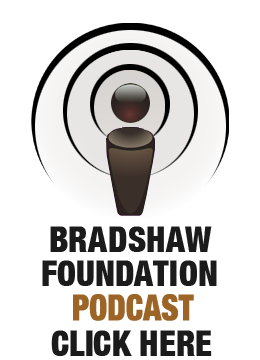 Acoustic analysis is a sonically based architectural analysis that can reveal detail about these practices. An understanding of the use of music, acoustics and sound in a space can act to animate the information we have from architectural fragments. Whilst architecture demarcates space, sound demarcates time. An archaeological study of a physical space is lifeless without an accompanying understanding of the narratives that developed within it, and the way they move through time, change and develop. Understanding the time-geographies of space is important so that we can understand how the users of a space felt about it. In prehistory sound would have been perceived differently than it is today. We are surrounded by sounds that are not part of nature, noises from machines, loudspeakers, televisions and mobile phones, from aircraft in the sky to ipod earphones in our ears. At a time when stone buildings were rare, spaces with acousticsthat were not part of nature would have been very acoustically striking to those who entered them. A man-made acoustic of any note was an extremely unusual thing. Sound was a primary focus for accumulating knowledge, culture and information in prehistory, as a great deal of transmission happened using language (the acoustic), rather than writing (the visual). We can expect to find as much out about the reasons for the layout of a site by investigating its acoustics as by investigating its visual and physical properties. This is perhaps especially the case in a site that does not seem to be designed for strictly functional purposes such as accommodation or defence, as music and sound are often to be found at the core of cultural, communal and ritual activities. Dr Rupert Till suggests that most previous studies of Stonehenge focused on looking at the site, rather than listening to it. He came up with the theory that the famous ring of stone could have sung like a crystal wine glass with a wet finger rubbing the rim. Thomas Hardy had hinted at this in 1891 in his novel Tess of the D'Urbervilles. Reading carefully between the lines with an acousticianís ear, one can find him discussing various acoustic effects. Further research turned up an interview with the author in which he states that 'if a gale of wind is blowing, the strange musical hum emitted by Stonehenge can never be forgotten'. 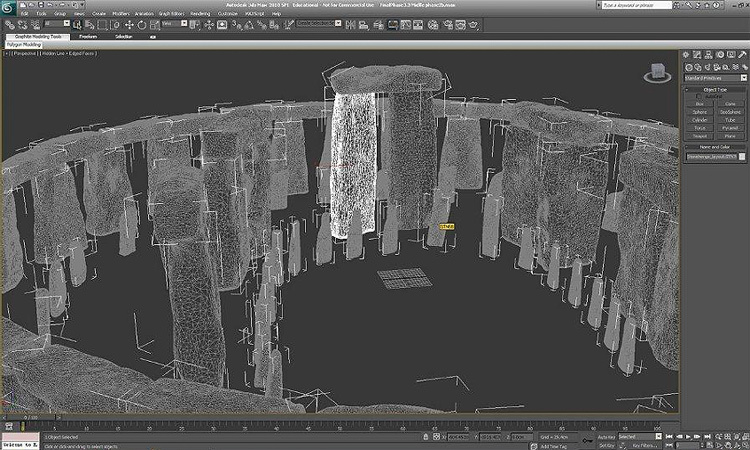 Mathematical acoustic analysis of Stonehenge's Archaeological plans was followed by the acoustic analysis of a digital model of Stonehenge using software designed for architects' use. The results of this analysis exceeded all expectations. The final stage of Stonehenge had acoustic figures that were as good as premier concert halls, and was perfectly suited to loud rhythmic music, much like a rock concert venue. This work led to a visit to a full size concrete reproduction of Stonehenge in the USA, with acoustics expert Dr. Bruno Fazenda and Dr. Till flying to the Maryhill Monument in Washington State to use it as a model to carry out acoustic field measurements and search for evidence of acoustic features. Here it was possible to make the whole space resonate using a simple percussion rhythm, made by reconstructions of Neolithic instruments, and tuned to the space. Strange acoustic effects appeared in the space as if the stones themselves were singing. Dr. Fazenda has been a key research partner in the project, providing a acoustic and scientific grounding to the project. 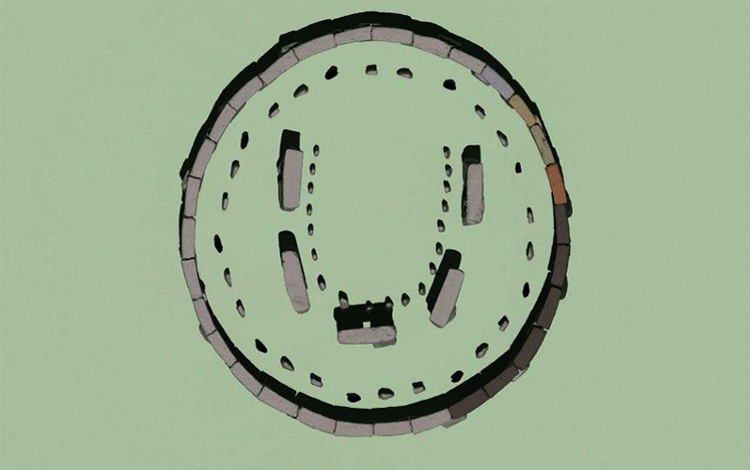 The project has suggested where people might have stood at Stonehenge, the sort of instruments possibly used, what kind of sounds could have been made and how fast people might have played. It has also allowed tentative steps towards suggesting that the music may have acted to entrain the body, encourage Alpha rhythms in the brain, and help achieve altered states of trance-like consciousness. 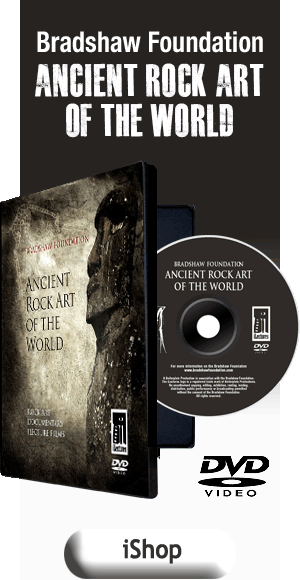 Few specifics are known about the music, sound and ritual of prehistoric Britain, and any information that this project can uncover is significant. Stone circles are an enigmatic feature of British prehistory, and the hope is that understanding more about our past is on way of further understanding our present. Stonehenge is famously aligned to the sunrise on the mid-summer solstice. However there is more archaeological evidence that in prehistoric Britain, people gathered at Stonehenge at sunset to celebrate the shortest day of the year, after which everything gets lighter and warmer, on the winter solstice. People often think of the winter solstice as being 21st December, however it varies between the 20th and the 23rd depending on the motion of the Earth and whether it is a leap year or not. This year English heritage will provide open access to Stonehenge on the 22nd December. The trouble is, it is often not possible to watch the sun setting from inside the stones for a number of reasons. It is often cloudy, and there are often thousands of people all trying to get inside the stone circle at sunset. 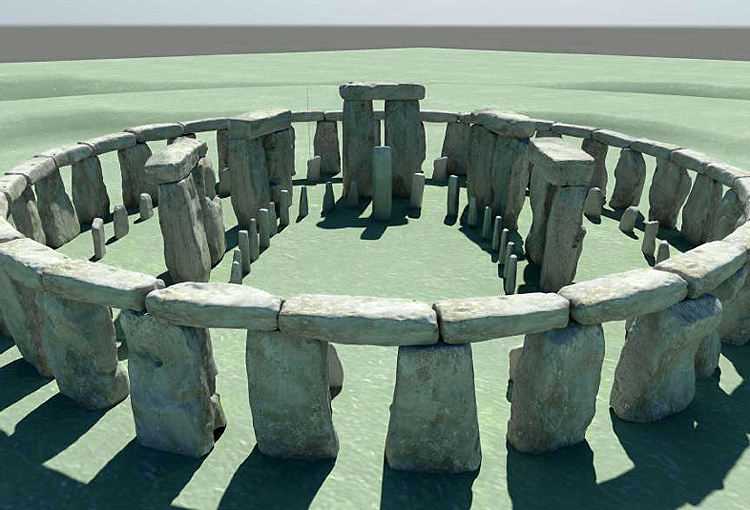 Also of course, half the stones at Stonehenge are missing or fallen, compared to the prehistoric version of the site. Add to this parking problems, and the cold of the exposed countryside, and one might wonder if there were a warmer way to experience the solstice at Stonehenge. Interactive iphone app developers Ribui, working with Researchers at the University of Huddersfield, have come up with an intriguing alternative. 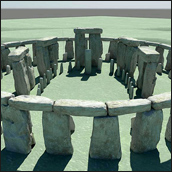 They have produced an iphone app that you can download, that includes models of Stonehenge. A computer model of the site has been created which allows you to see what the site would have looked like in prehistory. 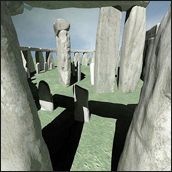 Advanced digital modelling has been used to provide an accurate reconstruction, an interpretation of what it may have been like to be at Stonehenge in prehistory. If you are actually at Stonehenge, the app uses Augmented Reality (AR) to work out where you are standing, and when you hold up your phone, it shows you what the site would have looked like, from your exact position, but as if you were there thousands of years ago. You can navigate interactively around the site, and explore it at will, without seeing fences or paths, allowing the user to fly over the top of the site, or zoom towards it. You can also see how the site developed over the years, how different arrangements of the stones were set up, drawing on the latest archaeological research. You can even stand virtually in the middle of the stones, and as you move your phone around, you can look around, with no other people present, and with all the stones intact and upright. At the same time you can put headphones in your ears, and hear how the echoes from the stone surfaces would have affected your voice. The computer model was originally created by project leader Dr. Rupert Till at the University of Huddersfield, in order to carry out acoustic analysis of the site, using architectural software. 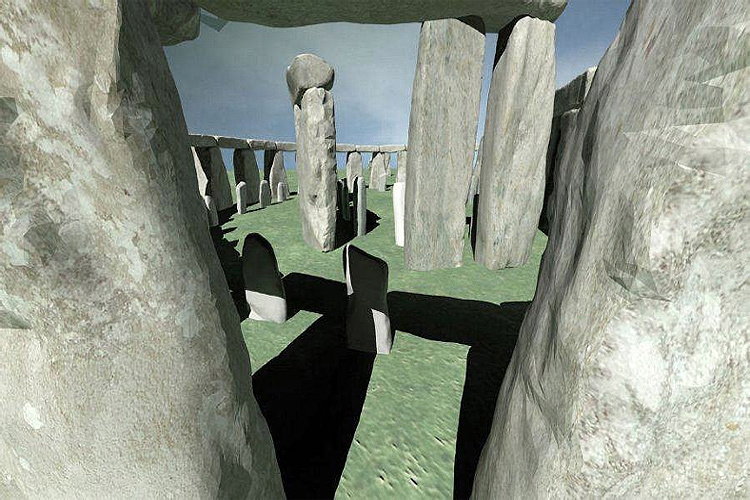 However, as the model produced by Dr. Ertu Unver and Andrew Taylor looked very accurate, the project decided to create multimedia files that reconstructed Stonehenge virtually. Commercial company Ribui, approached the University to develop the model into an interactive iphone app, and the final result is now released to the public. Smartphone apps offer a way to explore heritage sites like Stonehenge from anywhere, and also provide information to visitors to the site, as they are walking around it. 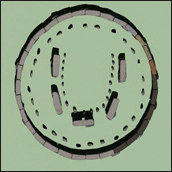 This app also features a model of the wooden circle at nearby Woodhenge, as well as information on other sites related to Stonehenge, like Durrington Walls, the Cursus and the so-called Bluestonehenge. It also allows one to dig out other archaeological finds on your iphone, and see and hear information about the archaeology of the whole surrounding landscape. Dr. Rupert Till is a Senior Lecturer in Music Technology at the University of Huddersfield. This page is focused on his research into the acoustics and sounds of Stonehenge. He studied performing arts in Leicester, focusing on musical composition, tutored by minimalist Gavin Bryars abd Scratch Orchestra member Christopher Hobbs, before specialising in Music Technology at York University. He went on to take a PhD with Katharine Norman and George Nicholson at Sheffield University. He has been teaching in higher education for 15 years. Much of his current teaching focuses on the composition of popular music. He founded electronica group Chillage People and the Abstract Film Orchestra, as well as chill out organisation Sundaze. He has a number of publications relating to Electronic Dance Music (EDM) and trance. He is Principal Investigator for the Arts and Humanities Research Council / Engineering and Physical Sciences Research Council funded Science and Heritage Programme research cluster, the Acoustics and Music of British Prehistory research Network.